Description: Usually departing Linwood during the night, a late 153 climbs the hill at dawn. Description: Sitting in Shattuc Siding waiting to meet NS 112 was NS Train 111 at sunset. Description: NS train 111 EB. Title: NS 9225, Splits the signals with a Morning Coal Train. Description: NS 2744 and 9225 head a van train at the "CURVE"
Description: NS 20W with SD70M-2 2744 and D9-40CW 9225. Description: An NS Eastbound screeches through Vickers Junction. Description: An NS Eastbound passes NS 331 during a crew change. Description: NS Columbus District MP 652. Description: Columbia Ave., 1311 hours. Description: At the BRW interchamge, 0930 hours. Description: NS 9225, the first of six locos for this train coming through Cresson, PA. 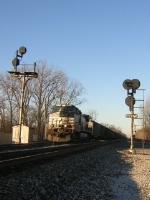 Description: Some Ex Conrail geeps among various locomotives and a stone train at Edgemoor Yard. Title: NS 9225 running light leads a long string of autoracks under Bolton Road.